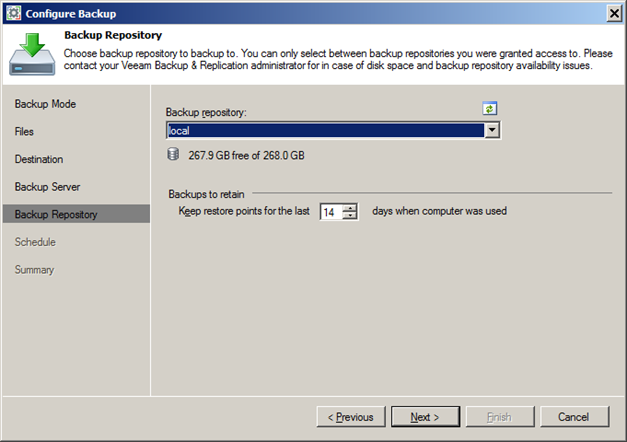 Some time ago, we released Veeam Backup & Replication v8 Update 2. 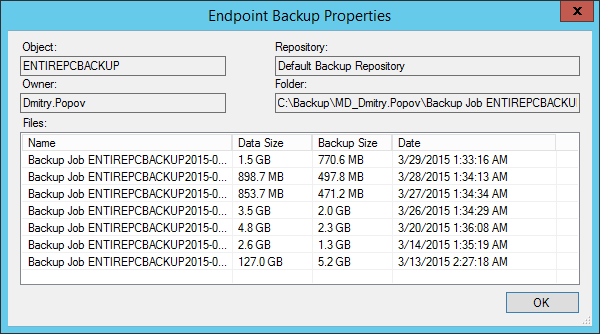 Why is this update important for Veeam Endpoint Backup FREE? The answer is pretty simple – starting from Update 2 you can use a Veeam Backup & Replication repository as a backup destination. Besides using a Veeam Backup & Replication repository as a backup destination (target) you receive many more possibilities. Let’s start today with the integration, data protection tasks and the additional administration possibilities that you get. Before configuring Veeam Endpoint Backup job to use a repository as backup target you need to take care of repository access permissions. I bet you don’t want your production backup repository to run out of space because of uncontrolled end- user’s backups, so we got you covered. Important note - default backup repository will have ‘allow everyone’ access permissions from scratch for testing purposes and quick demo setup but we strongly advice to remove these permissions in production environments. Another note is that you can’t use a cloud repository as a target, but we will come back to that later. We have already discussed the endpoint’s backup job configuration in my previous posts, so the only thing you need to do now is to select the Veeam Backup & Replication repository destination, type in the IP address or DNS name of the Veeam Backup & Replication server and enter the repository access credentials. If all was set correctly you will be able to choose the repository and the retention range as previously explained. After you have run a backup it is stored in a Veeam repository and Veeam Backup & Replication recognizes a new backup type – Endpoint backup. Under the backups node, you will view the different backups, the creation time and the amount of restore points. These views will give you a clear overview of all the protected endpoints, on which repository they are stored and the amount of restore points you have for each of them. There is a small difference while using the restore functionality from copied endpoint files since user access permissions are not preserved during backup copy job. It means users won’t be able to restore their data from the secondary location, unless you tune the access permissions or simply use administrative account which always has access to all the backup files. Archiving to tape is also supported: by creating a backup to tape job you can store your endpoint backups on tape media in a traditional way. Combining two products means you get more functionality at the administration side. It becomes possible for an administrator to view statistics about Endpoint backups and gain more insight in what is happening on the different endpoints. You can easily disable an endpoint backup job from the Veeam Backup & Replication console if needed. Removing or deleting endpoint jobs might be tricky: if endpoint job gets deleted from a console, the next time endpoint starts a backup – job will appear in the list again. Deletion simply removes the records about the job from the console, the backup, however, remains untouched and can be used afterwards for recovery. If you want to disable all the endpoints completely - using repository permissions might be a better idea. 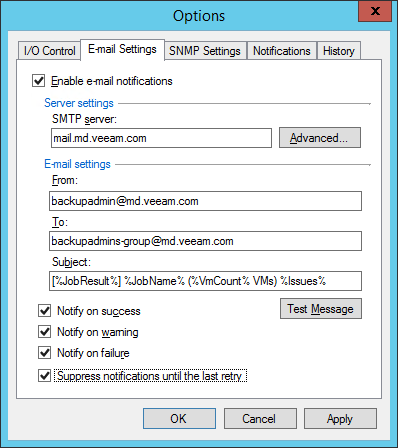 Don’t forget that Veeam Backup and Replication’s global notification and network throttling settings apply to endpoint backup jobs. Integrating Veeam Endpoint Backup FREE with Veeam Backup & Replication is more than just the possibility of using your repositories as a backup target. With the integration, you receive a ton of additional possibilities such as backup copy jobs, backup to tape and even backup copy job to a cloud repository. Additional administration tasks such as global email notifications, network throttling and the ability to remove / delete endpoint backups are also options you now have. In my next blog, I will run over the additional recovery options that you receive when integration Veeam Endpoint Backup FREE with Veeam Backup & Replication.